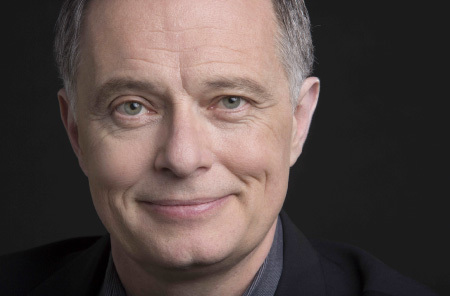 Kent Tritle is one of America’s leading choral conductors. Called “the brightest star in New York’s choral music world” by The New York Times, he is Director of Cathedral Music and Organist at the Cathedral of St. John the Divine in New York City; Music Director of Musica Sacra, the longest continuously performing professional chorus in New York; and Music Director of the Oratorio Society of New York, the acclaimed 200-voice volunteer chorus. In addition, Kent is Director of Choral Activities at the Manhattan School of Music and is a member of the graduate faculty of The Juilliard School. Also an acclaimed organ virtuoso, Kent Tritle is the organist of the New York Philharmonic and the American Symphony Orchestra and a member of the organ faculty of the Manhattan School of Music. Kent’s 2018-19 season is marked by the expansion of the Oratorio Society’s Carnegie Hall season from three to four concerts, which will include Kullervo, the rarely-performed symphonic poem by Sibelius, Szymanowski’s Stabat Mater, and Verdi’s Requiem. In addition to performing programs spanning the choral repertoire, including its acclaimed annual presentation of Handel’s Messiah, Musica Sacra participates in live score performances of 2001: A Space Odyssey with the New York Philharmonic (a repeat collaboration) and the Detroit Symphony Orchestra. And concerts by the Cathedral Choir of St. John the Divine on the Cathedral’s Great Music in a Great Space series feature the latest event in the choir’s collaboration with early/world music ensemble Rose of the Compass: a program marking the centennial of the WWI Armistice and Armenian independence. Kent continued a 2018 run of performances as organ soloist in Saint-Saëns’s “Organ Symphony” with the New York Philharmonic at the Bravo! Vail summer festival, and performs recitals in the U.S. and abroad during the season that included two in Germany in July, at Munich’s Erlöserkirche and Kyllburg’s Himmerod Abbey. Among Kent’s recent notable performances: at the Cathedral of St. John the Divine, Verdi’s Requiem, Mahler’s “Symphony of a Thousand,” and Britten’s War Requiem performed by the Oratorio Society of New York and the Symphony and Symphonic Chorus of the Manhattan School of Music, the New York premiere of Einojuhani Rautaavara’s Vigilia that Opera News called “a choral concert for the ages,” and programs of early music with the Cathedral Choir in the Chapel of St. James; with Musica Sacra, world premieres of music by Juraj Filas, Michael Gilbertson, and Robert Paterson and an acclaimed performance of Rachmaninoff’s All-Night Vigil; and with the Oratorio Society of New York, the world premieres of the Paul Moravec/Mark Campbell oratorio Sanctuary Road and of Juraj Filas’s Song of Solomon, and performances of Moravec’s Blizzard Voices and Songs of Love and War, Filas’s Requiem “Oratio Spei,” and Mozart’s arrangement of Handel’s Messiah. Kent has created high-profile collaborations for his groups with other major players in the New York music scene, directing the Manhattan School of Music Symphonic Chorus for performances of Beethoven’s Symphony No. 9 with the New York Philharmonic led by Alan Gilbert; Musica Sacra for the New York Philharmonic’s presentation of 2001: A Space Odyssey film screening and live score performance, also led by Gilbert; and the Oratorio Society of New York for Beethoven’s Missa Solemnis with the Orchestra of St. Luke’s led by Sir Roger Norrington, and Carnegie Hall’s 125th Anniversary Gala. In 2013, Kent was the chorus director of the Carnegie Hall National High School Choral Festival, preparing three choruses from high schools across the country in Mozart’s Requiem. He also led the “Mass Appeal Mass” of the “Make Music New York” festival for three years, including the 2012 premiere of a work by Philip Glass in Times Square. As part of his work as Director of Choral Activities at the Manhattan School of Music, Kent Tritle established the school’s first doctoral program in choral conducting. Tritle is also renowned as a master clinician, giving workshops on conducting and repertoire; in 2017 he made his fourth appearance as a featured conductor at Berkshire Choral International, leading Mahler’s “Symphony of a Thousand,” and he leads annual choral workshops at the Amherst Early Music Festival. Recent years have included workshops at Summer@Eastman and at the Sibelius Academy in Helsinki. A Juilliard School faculty member since 1996, he currently directs a graduate practicum on oratorio in collaboration with the school’s Vocal Arts Department. In more than 150 concerts presented by the Sacred Music in a Sacred Space series from 1989 to 2011, Kent Tritle conducted the Choir and Orchestra of St. Ignatius Loyola in a broad repertoire of sacred works, from Renaissance masses and oratorio masterworks to premieres by notable living composers, earning praise for building the choir and the concert series into one of the highlights of the New York concert scene. From 1996 to 2004, Tritle was Music Director of the Emmy-nominated Dessoff Choirs. Kent hosted “The Choral Mix with Kent Tritle,” a weekly program devoted to the vibrant world of choral music, on New York’s WQXR from 2010 to 2014. Kent Tritle has worked with a wealth of young singers over the years, and several with whom he was worked frequently are on the leading edge of the current group of young stars in opera and concert, including sopranos Susanna Phillips, Emalie Savoy, and Jennifer Zetlan; mezzo-soprano Sasha Cooke; and tenor Paul Appleby. Tritle has prepared choruses for conductors Alan Gilbert, Philippe Entremont, Christoph von Dohnányi, Leonard Slatkin, Michael Tilson Thomas, Robert Spano, Gerard Schwarz, Vladimir Spivakov, Nicholas McGegan, Leon Botstein, and Dennis Russell Davies. Among the soloists with whom he has collaborated are singers Renée Fleming, Jessye Norman, Hei-Kyung Hong, Marilyn Horne, Susanne Mentzer, Susan Graham, and Sherrill Milnes; cellist Yo-Yo Ma; and pianist André Previn. As an organ recitalist, Kent Tritle performs regularly in Europe and across the United States; recital venues have included the Leipzig Gewandhaus, the Zurich Tonhalle, the Church of St. Sulpice in Paris, Dresden’s Hofkirche, King’s College at Cambridge, Westminster Abbey, and St. Vitus Cathedral in Prague. With the Philharmonic he has performed Saint-Saëns’s Organ Symphony conducted by Lorin Maazel, Andrew Davis, Antonio Pappano, and David Robertson, and recorded Brahms’s Ein Deutsches Requiem, Britten’s War Requiem and Henze’s Symphony No. 9, all conducted by Kurt Masur, as well as the Grammy-nominated Sweeney Todd conducted by Andrew Litton. He is featured on the DVDs The Organistas and Creating the Stradivarius of Organs. Kent Tritle’s discography of more than 20 recordings on the Telarc, AMDG, Epiphany, Gothic, VAI and MSR Classics labels includes the 2016 performance of Mahler’s Symphony No. 8, David Briggs’s organ-choral version, which received a rave review in The American Organist, and Eternal Reflections: Choral Music of Robert Paterson with Musica Sacra, about which Gramophone said, “As shaped by Music Director Kent Tritle, the myriad hues, lyricism and nobility in Paterson’s music emerge in all their splendour.” Other releases, including his 2013 recording of Juraj Filas’ Requiem, Oratio Spei dedicated to the victims of 9/11, with the Prague Symphony Orchestra and the Kühn Choir; Messages to Myself, an acclaimed recording with Musica Sacra of five new works; and two releases with the Choir of St. Ignatius Loyola, Cool of the Day – an a cappella program of music ranging from Gregorian chant, Palestrina, and spirituals to Strauss’s Deutsche Motette – and Ginastera’s The Lamentations of Jeremiah with Schnittke’s Concerto for Choir, have been praised by Gramophone, the American Record Guide, and The Choral Journal. Kent is on the advisory boards of the Clarion Music Society and the Choral Composer/Conductor Collective (C4).